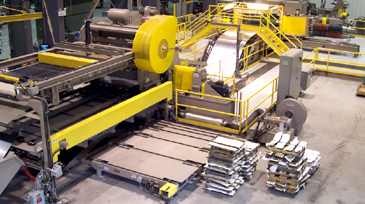 Huger, SC - Steel Technologies has installed a high-production close-tolerance Multi-Blanking Line in its Huger, SC coil processing facility. 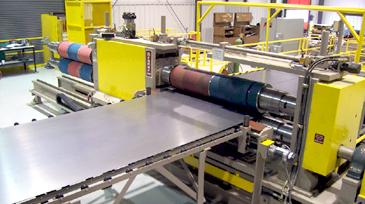 The Multi-Blanking line has the ability to convert 80,000# x 72" wide bare and coated carbon and stainless steel coil into panel-flat sheets and precision blanks in gauges from .024" through .135". Equipped with the latest high cyclic rate Servo Feed-DC Shear technology, the line can operate at more than 75-cycles minute. The new Multi-Blanking Line joins a Braner/Loopco 80,000# x 72" double-loop Triple Turret Head™ Slitting Line in the Huger, SC plant. Precision Hydraulic Leveler: A massive 4-post, 17-roll x 9-flight x 5-Hi Roller Leveler produces panel flat shape corrected parts for Steel Tech. All Leveler work roll and back-up adjustments are accomplished by microprocessor controlled hydraulic cylinders, instead of electric motors, gear reducers, and sliding wedges. Hydraulic cylinders positioned at the entry and exit ends of each back-up flight accomplish entry-exit work roll gap and side-to-side shape correction roll bend adjustments. Electronic linear transducers sense the position of each hydraulic cylinder. Adjusting the entry end and exit end cylinder elevations causes the work rolls to be "tilted" front-to-back for coil-set correction. Adjusting cylinder elevations from side-to-side across the Leveler roll face causes the back-up flights to be set-up for "roll-bending." Accurate roll bend is necessary for wavy-edge and center-buckle shape correction. Hydraulic Leveler benefits include elimination of mechanical backlash, ability to precisely repeat roll position settings, reduced maintenance, and set-up automation. Computer Leveler Controls: 18-hydraulic cylinders are used to adjust the Steel Tech Leveler for strip shape correction. Because there are so many possible back-up and work roll position adjustments, the Hydraulic Leveler is controlled by a PC computer. The operator enters the material yield strength and gauge and the computer calculates the entry and exit work roll gap dimensions and sends the commands to the cylinders. Cylinder transducers communicate position data to the computer as the Leveler automatically sets itself up. Edge wave and center-buckle correction can be accomplished via the computer or operator override. A computer memory is available to commit the back-up and work roll positions to a memory for future recall. This feature is a valuable time saver particularly when processing partial coil runs. Leveler calibration is a time-consuming job with "mechanical" levelers. The Hydraulic Leveler has an "Automatic Calibrate" feature that calibrates the Leveler in a few minutes without dismantling the Leveler. 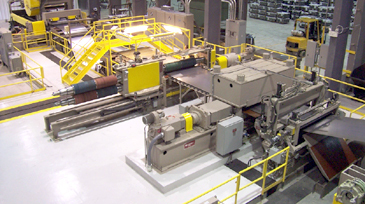 Turret Head™ Multi-Blanking Slitter: Coils are slit into multiple ±0.002" width tolerance strips by a 2-head Turret Head™ Slitter installed immediately after the Cassette Leveler. 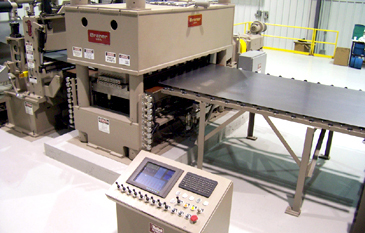 The Slitter is synchronized with the Leveler to run at a constant non-stop line speed, which results in precise and consistent slit edge conditions. Rubber strippers installed across the entire coil width support wide thin-gauge strips prevent strip buckling and assures precise width tolerances. Specially formulated multi-blanking tooling and "pushbutton" tooling lock-up allows set-ups to be completed in 15-minutes while the line is running. The ability to prepare set-ups while the line is in operation can greatly improve productivity. Like all Turret Head Slitters™, head changes are accomplished in less than 2-minutes, and reliability is "bullet-proof."